The CD-ROM model had 64 MB of RAM motherboard RAM, giving it a maximum of 576 MB of RAM. 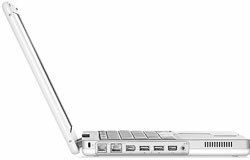 Announced in May 2001 at a special press event, the iBook (Dual USB) brought the design aesthetic of the PowerBook G4 to the consumer level. The iBook (Dual USB) was much smaller than its predecessor, and included a faster G3 processor, more RAM, VGA out, stereo speakers, and a higher resolution screen. It also was the first Mac to include a "Combo" DVD-ROM/CD-RW drive in the high-end model. 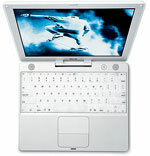 The iBook (Dual USB) was available in four configurations, each with a different optical drive: The CD-ROM model, with 64 MB of RAM, was $1299, The DVD-ROM model, with 128 MB of RAM, was $1499, the CD-RW model (available only as a BTO option at the Apple Store), with 128 MB of RAM, was $1599, and the "Combo" DVD-ROM/CD-RW Model, with 128 MB of RAM, was $1799.